This article is about Shards from Thaumcraft 3. You may be looking for Air Shard, Fire Shard, Water Shard, Earth Shard, Order Shard or Entropy Shard from Thaumcraft 4. 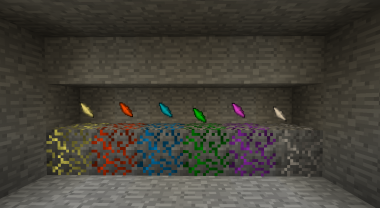 All crystal ores with the respective shard above. Shards are crystals that generate as ore underground, in seams of 1-4. There are 6 shard types: Fire, Water, Air, Earth, Vis, and Dull. All shards contain 2x Praecantatio and 2x Vitreous Aspects, as well as 2x of 2 more Aspects related to the crystal, except for dull, which has no extra. The ore that shards come from helps keep the aura from depleting by transforming into dull ore and releasing Vis when it gets very low. Shards are an essential crafting item used in many Thaumcraft 3 recipes, including the Wand of the Apprentice, the Wand of the Adept, the Crystal Capacitor, Crystal Clusters, and far more. In addition to use in Thaumcraft 3, it is possible to produce IndustrialCraft2 EU by employing the GregTech 4 Magic Energy Converter. It is also possible to produce shards by breeding bees from the Magic Bees mod. Production of Dull Shards is possible with the Stark Bee. Stark Bees may further be enchanted to produce 5 other bee species, one corresponding to each type of shard. Additionally Dull Shards can be produced from the other 5 shards by employing GregTech 4's Magic Energy Converter; after discharging all their energy, a dull shard is outputted from the machine. Yet another way to obtain shards is to trade with the Thaumcraft villager. They will usually offer 3 shards in exchange for one emerald. Silk Touch will not produce ore blocks as they do for other gems and crystals. However, the Fortune and Treasure enchantments do affect the number of shards. The ore is called <Shard type> Infused Stone. (e.g. : Fire Infused Stone) It is not obtainable without cheating it into your inventory. The type of the shard (and ore) depends on a secondary data field (beyond the item ID of 25261), which is also used to store the damage for tools and so is commonly referred to as a “damage value”, or the DV. This page was last modified on 19 May 2016, at 21:37.